In this video we will discuss how to add custom data to a state in angular. 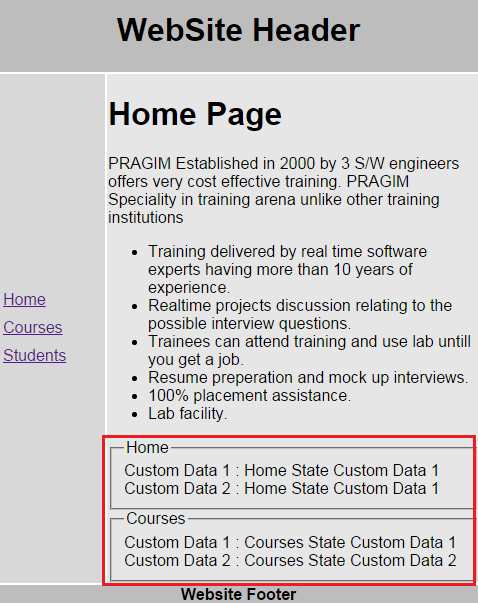 customData2: "Home State Custom Data 2"
customData2: "Courses State Custom Data 2"
The custom data is now available in all the controllers. To access state custom data from it's controller (i.e to access home state data from home controller) use $state.current.data.customPropertyName. To access state custom data from a different controller (i.e to access courses state data from home controller) use $state.get("statename").data.customPropertyName. With all the above changes, the custom data will be displayed on the home view as shown below.